London 1885. An orphan from a far-off land is renamed "Noah Ames," and given every advantage the English Crown can bestow. London 1592. Now an experienced barrister, Noah witnesses what appears to be a botched robbery outside the Rose Theater, a crime he soon suspects to be part of a plot against Queen Elizabeth herself. Steadfast in his loyalty to the Queen, Noah must use every bit of his knowledge and skill to lure her most disloyal subject onto the only battlefield where Noah has the advantage … a court of law — though in doing so he risks public exposure of his darkest secret, a secret so shocking that its revelation could cost him everything: the love of the only woman who can offer him happiness, his livelihood … even his life. Hello and thanks for coming by my blog. My historical fiction, A Second Daniel, set in Elizabethan England, is 99 cents this month. Pick up your copy here. You can also get a free prequel short story by signing up for my newsletter here. And you'll certainly want to be kept in the loop, as book three in the series, A Dragon in the Ashes, is releasing very soon! Fans have said some great things about A Second Daniel. "In Neal Roberts' spectacular debut, a gripping tale of murder and conspiracy unfolds against the lush tapestry of Elizabethan political intrigue. Roberts breathes vibrant life into 16th-century London, populating it with an array of enthralling characters. A Second Daniel is a spellbinding historical mystery, and Neal Roberts is an author to watch!" 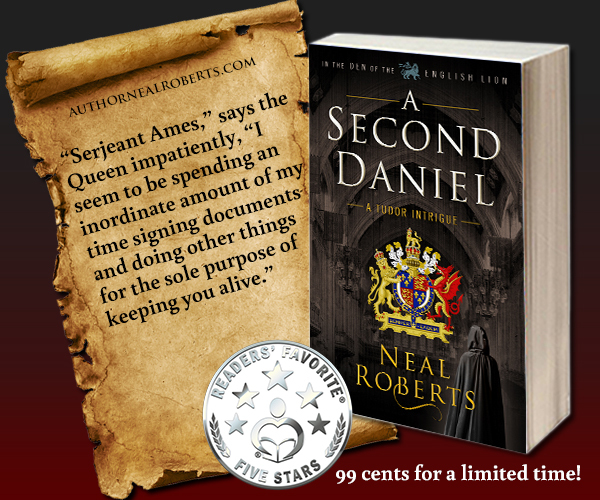 "With A Second Daniel, Neal Roberts captures Elizabethan London so skillfully, it's as if the reader has stepped right into the story. Barrister Noah Ames is a compelling protagonist of intelligence and heart who conceals a dangerous secret unknown even to his closest friends. A riveting debut historical mystery by an exciting new talent!" And don’t forget you can get A Second Daniel for 99 cents here and claim your copy of the exclusive prequel story by clicking here. Thanks so much to Patricia Lynne for organizing this blog hop and helping readers find new and exciting books. Be sure to visit some other stops on the hop and discover more stories. Thanks for joining the hop. I grabbed your book and am looking forward to reading. Happy New Year. Sounds like an awesome read! Thanks!